I’m prepared to bet dollars to doughnuts that all astronomers reading this know what an impact crater is, and knows that they’re circular in shape when seen from directly overhead, unless the impactor that formed the crater struck the surface at a very low, oblique angle. After all, you only have to take a cursory look at the near-side of our own Moon – the side we can observe from Earth with our own back-yard telescopes – to see that this must be true. But are you sure it’s true? What if I told you that it’s false : that most impact craters do indeed have a circular plan view immediately after impact, but that very rapidly after the initial impact – the circular shape evolves and - in many cases - becomes polygonal ? 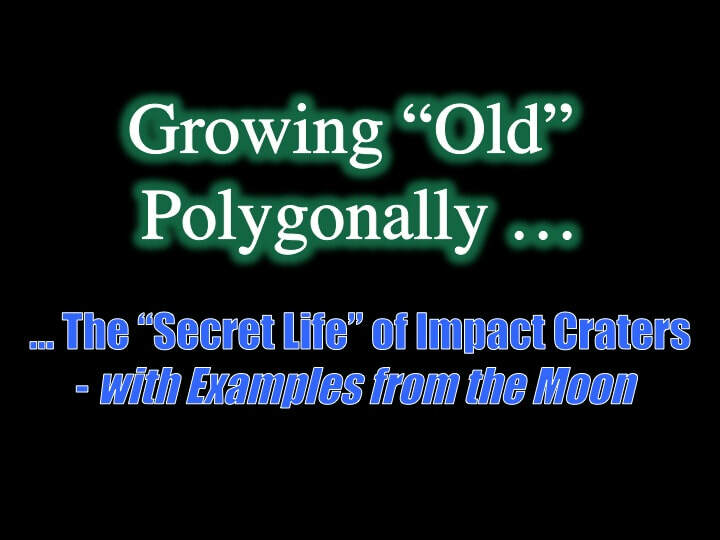 What if I told you that – instead of "growing old" gracefully – impact craters mature “polygonally” ? I’m going to try to convince you of this using examples of generally well known impact craters visible to amateur astronomers on the near-side of the Moon. 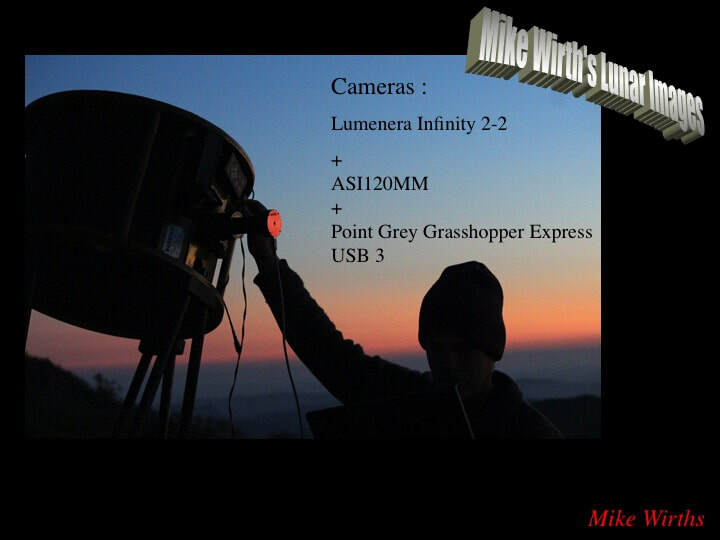 My “partner-in-crime” for this presentation is Mike Wirths – one of the world’s leading lunar imagers. 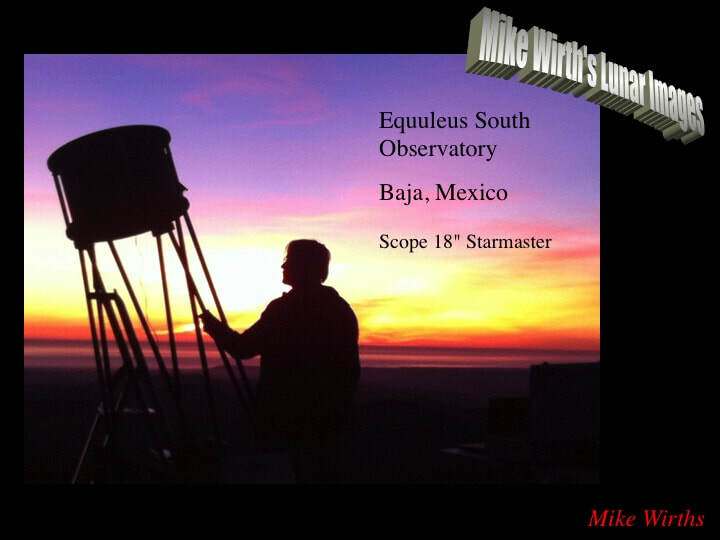 He was based just outside of Ottawa before moving to clearer skies in Baja, Mexico – accompanied by his telescope equipment and cameras. His superb images of the Moon’s surface are regularly featured on the LPOD web site, and I would strongly recommend that you check them out in the original resolution. I originally talked to him about putting together this presentation using his images some 2 years ago - and now, at last, we have it in hand. We’ve also included a few images from other sources, that I’ll point out as we go. Here’s one of the quintessential lunar impact craters : Tycho. What do we see when we examine an impact crater like Tycho? The crater floor – in this case with a central peak - is readily distinguished from the raised crater rim, but the rim itself is made of two very different components : terraces and scarps. The terraces are best seen on the east side of the crater where they look like the pictures you may have seen in travel magazines of rice paddies decorating steep hillsides in many Asian countries. The difference being that in the case of Tycho, the terraces result from an orderly collapse of the bedrock that formed the original inner wall of the rim as it slid into the initial impact cavity. Elsewhere around the rim, it’s more difficult to make out the distinctive terrace structure. This is because the collapse mechanism was more chaotic resulting in large-scale messy landslides, instead of neat and tidy terraces. Whatever the mechanism of flow of the collapsing material, terraces and landslides alike can leave scars in the outer part of the crater rim – essentially tall, steep cliffs, or scarps. If you now consider the base of the collapsed rim material separately from the outer perimeter of the impact crater itself, both are approximately circular in outline in the case of Tycho. However, when I first saw this image - taken by Mike Wirths – of the flooded (swamped) impact crater Lacus Mortis, I was puzzled : really puzzled. Although the lavas that flood the crater almost reach the top of the crater rim, you can clearly see that the outer perimeter of the impact crater is a polygon – bounded by 5 preserved straight walls of approximately equal length, separated by a characteristic internal angle of 120°. I suggested in a previous presentation that Mike and I gave back in 2009 that Lacus Mortis was in fact symmetrically hexagonal in shape : but I was completely stumped as to how this might have happened. Polygonal impact craters were first identified in the late 1800s. You might assume that impacts simply exploited pre-existing fractures in the bedrock. This was indeed the fundamental conclusion of a Finnish PhD thesis in 2009. However, there’s no sign of hexagonal fracture patterns in the area – or anywhere else on the Moon - and in any event, hexagonal fracture patterns - especially symmetrical - are difficult to impossible to produce tectonically (by pushing and pulling). Instead, during the 1950s and 1960s, scientists attributed the straight sides of lunar craters to pre-impact quadrilateral – or diamond-shaped – conjugate fracture patterns (referred to as the “Lunar Grid”) that do indeed occur all over the Moon, and are probably responsible for the diamond shape of the Aristarchus Plateau (that contains the famous Schroeter’s Rille). But 4 fractures do not define a hexagon … and in addition this ad hoc explanation would not apply on other Rocky Planets where hexagonal craters also form. So I started scanning the Moon and lunar literature looking for other examples of non-circular impact crater shapes, and I found them – everywhere. Copernicus has to be one of the all-time favourite craters for amateur lunar observers. But it wasn’t until I started asking myself about Lacus Mortis that I realised that I’d looked at Copernicus many times, but never seen it ! Look at the crater rim - and separate the base of the collapsed terraces and landslides from the outer rim scarps. The base of the collapsed material has a roughly circular shape, but the outer scarps clearly define a perfect hexagon, with 6 straight sides separated by 120° internal angles. Even Plato, the “quintessential” flooded circular crater, has local scarp faces that are pretty straight (see left) – though I’d never call Plato “hexagonal” or even “polygonal”. Rather, it seems to represent something intermediate between the shapes of Tycho and Copernicus. Just so you don’t think this is an optical illusion, here are three relatively small impact craters – pretty much face-on with no optical distortion, or foreshortening, due to location – all of which show clear hexagonal morphology, especially Encke - which is even drawn hexagonal in Rükl’s lunar atlas ! Let's now look at a set of 4 highly popular impact craters located in the lunar highlands near the middle of the visible lunar surface, so we can – yet again - observe them with a minimum of distortion. Ptolomaeus is a very obvious flooded hexagon with 120° internal angles in the style of Lacus Mortis. The lava within the crater has covered the collapse features of the crater rim and the lower parts of the outer rim scarps. Neighbouring Alphonsus – in this image by Wes Higgins - shows a similar overall form to Ptolomaeus, but I can only hold a ruler to 3 sides, and I can only point to two clear-cut 120° internal angles. Albategnius is similar in form to Ptololmaeus, with a good hexagonal shape and internal 120° angles, despite having been heavily battered. Note that the flooding of the crater was less extreme than for Ptolomaeus. as evidenced by the preserved central peak and the visible upper levels of the collapsed material. Using Copernicus as an illustration, this is how I think things might work. The scarps are major fractures in bedrock, not in loose, unconsolidated material. Fracture mechanics can be very complicated, but it can be understood - if you’ll allow me to simplify. Let’s look at the simplest crack possible : it could be any size, and it could in your ceiling plaster at home, so don’t try to directly match the overly simple diagram (right) to the complexities of Copernicus itself. The situation mid-way along the length of the crack is pretty simple; a tensile (pulling apart) stress (red) acts to open the crack. As you might expect, once the strength (the resistance to initial fracturing) of the material (bedrock/plaster) is overcome, the opening of the crack tends to relieve/relax the driving stresses in the mid-section of the crack. But the crack has a finite length : so – by definition – the crack has ends or “tips”, and this is where life gets complicated. So, this is where I’m going to simplify things dramatically. The complication is this : the simple fact of the crack opening and propagating along its length to its tips induces new stresses at the tips themselves. As long as the crack stays simple – and that also means “straight” - the new stresses induced by the crack itself will help the crack grow longer (propagate). But if the growing crack tries to bend, different stress fields will be induced at the crack tips, which may make it harder for the crack to grow longer. My simple explanation here applies to tensional cracks, but the same general principles apply to sliding cracks too. You’ve probably heard the old adage that states that “Mother Nature is lazy” – she’ll always take the path of least resistance. Well, in this case, the path of least resistance is to keep the crack straight. So, in the case of a large scale, orderly collapse of the crater rim by neat and tidy terraces, we see them backed by the long, straight scarps that they slid down, and – where they are well developed all round the crater - the resulting geometry of the outermost crater rim is hexagonal. Why hexagonal ? I suggest that 6 is the minimum number of fractures required to circumscribe an initially circular planform of the initial transient impact cavity. In the case of crater rim collapse by messy landslides made of lots of short fractures, long straight scarps might have formed as collapse initiated - but there’s no requirement for them to do so. Hence crater rims tend to remain circular in outline. So, when I say “Growing Old Polygonally”, by “old” I mean immediately after the initial impact cavity formed and the crater walls began to collapse - which is really pretty young, if you get my meaning ! Now, bearing this hypothesis in mind, let’s now take a look at some other examples of polygonal impact craters and basins. I’m sure that many of you have looked at Theophillus; it’s a very nice, circular impact crater. But take a look at it’s older neighbour – Cyrillus : it may be beaten to a pulp, but it’s clearly defined by a hexagonal outer rim. Here are well known Aristoteles and Eudoxus, with their smaller, more subtle neighbour - Egede. Neither Aristoteles nor Eudoxus shows signs of neat, orderly collapse terraces – both show evidence of messy landslide collapse – but both show well illuminated western outer rims defined by straight scarps and 120° internal angles. Egede, on the other hand, is flooded and defined by a crater rim that looks like a hybrid between a circle and a polygon : in this case a distorted square (4 sides). Here’s Letronne, a tilted and flooded impact crater that you could easily dismiss as circular in outline. But it certainly has one straight segment to its outer rim (lower right) : so I would identify this as a hybrid too. Posidonius is another great favourite among lunar observers. But take a good look at ghostly Chacornac on its SE side. Posidonius is indeed round – but Chacornac is hexagonal in outline. While we’re here – take a close look at Daniell crater : the illumination in this image clearly brings out the 3 straight segments and the 2 internal angles of 120° on its west side. Hands-up all those who’ve never observed Clavius through a telescope. Now, how many of you spotted the 3 straight sides on the western part of the outer rim (with the 120° internal angles) ? Which brings us back to Hercules - which we previously saw in the bottom right corner of the image of Lacus Mortis – and its next-door neighbour Atlas. Although the southern parts of the crater rim in both cases certainly look circular in outline, the northern parts of both are well illuminated and clearly made of straight segments: 3 in the case of Hercules, with two 120° internal angles. Even when the view is extremely foreshortened due to the location of the crater close to the lunar horizon (limb), we can still clearly see the hexagonal outer rims of numerous flooded craters – flooded such that their internal collapse features are hidden from view. This last point is going to be common to the next two images as well, so keep it in mind. Here we see the crater J. Herschel, which preserves a very nice hexagonal shape. Also, note hexagonal Pythagoras ! Moving to the NE lunar limb, notice Gartner crater. I’m going to suggest to you that many of the least ambiguous hexagonal impact crater outlines are most evident when the craters have been flooded - such that only their external rim margins are visible (preserved/highlighted) because - as proposed in the hypothetical model above - that’s where the long, straight collapse-related scarps would be located, and they are what define the polygonal crater shapes. In addition, the potentially circular “noise” represented by the collapse terraces and landslides has been filtered out in these flooded craters. Most of the craters I’ve discussed so far - perhaps with the exception of Egede - have been in the same general size range. So how does my hypothesis work for impact features of other sizes ? Here’s Wallace crater in the SE corner of the Imbrium impact basin. Just like Egede, it looks to me like a distorted square with 4 “straight” sides. So here’s a take home message : small impact craters only need 4 straight scarps in order to successfully collapse by long fracture propagation, whereas larger impact craters require 6. What do we find if we examine really large impact craters ? Well, here’s tilted and flooded Sinus Iridum on the NW side of the Imbrium impact basin : one of the most observed features on the Moon. I see 4 straight segments with internal 120° angles. How many of you have recorded that in your observing notes? Let’s go up in scale : Here’s another favourite – the flooded Crisium impact Basin. Tell me that’s not bounded by six straight segments with internal 120° angles ! Moving to the big impact basin scale; here in the SW corner of Mare Serenitatis we see two, admittedly relict, straight segments with an internal 120° angle. So, does that mean that all major impact basins are hexagonal in shape ? Most certainly not ! This is pretty obvious from this satellite image of the enormous Mare Orientale impact basin – which we can only glimpse very obliquely from Earth – which shows that its multiple collapse scarps are clearly circular in shape. Why? I think that it’s so large that the collapse scarps are so numerous that they merge visually into a pretty continuous circular geometry. So, my take-home message is this : when you next look at impact features on the Moon – take the time to “see” what you’re “looking” at. In particular, make sure that you distinguish the inner collapse terraces and landslide materials from the outer crater rims. Where the craters or impact basins are flooded with lavas, be aware that you may only be observing the outer crater rim. Many impact features have remained circular in outline since their formation, but many have not. I find it interesting that many well known lunar commentators – including Chuck Woods of LPOD fame – do not highlight this aspect of impact crater evolution, even when it is readily apparent in the images they are describing. See how many square and especially hexagonal impact crater and basin shapes you can identify on the Moon’s surface through your telescope !